Tim Ferriss interviewed more than 300 famous people from all kinds of industries. He asked them a set of questions about their life and their way of living and facing problems. 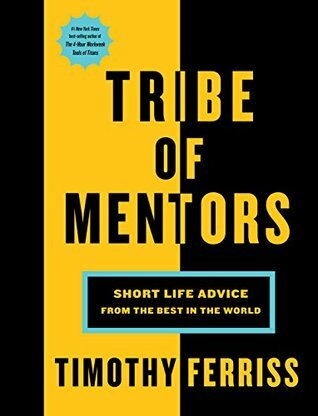 His book Tribe of Mentors is a collection of the best answers from his interviewees. One question that Ferriss asked is very actionable: “In the last five years, what new belief, behavior, or habit has most improved your life?” Answers to this one question gave us plenty ideas on how to improve your life the most. Timothy Ferriss is an American author, entrepreneur, and public speaker. He has written a number of self-help books on the "4-hour" theme, some of which have appeared on the New York Times, Wall Street Journal, and USA Today bestseller lists, starting with The 4-Hour Workweek. Ferriss is also an angel investor and an advisor to Facebook, Twitter, StumbleUpon, Evernote, and Uber, among other companies. Choose and develop your happiness. When something goes wrong, use this thought process. Do a series of stretches just after waking up. Start to believe that we are all mini gods. Engage in your “fear practice” for two minutes each day.